(Phys.org)—A team of researchers from several institutions in the U.S. has found that algae growing on packed snow causes the snow to melt faster. In their paper published in the journal Nature Geoscience, the team describes testing the impact of algae growing on snow and measuring its impact on an Alaskan ice field. As the planet continues to warm, scientists around the globe seek to learn about resulting changes. In this new effort, the researchers looked at the impact of algae growing on icefields in Alaska. Chlamydomonas nivalis is a type of fresh water algae that is hardy enough to survive while living on the snowflakes that make up ice fields in polar regions. Because of its pinkish hue, it causes what is commonly known as "watermelon snow." 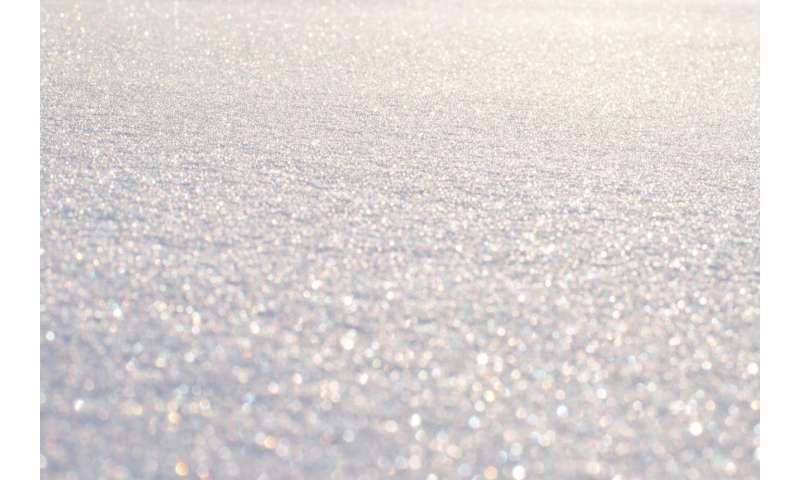 Logic suggests that colored snow reflects less heat than white snow and that was what prompted the researchers to look into the impact that the algae is having on the ice fields. The study consisted of adding water to small designated areas and fertilizer to others on the Harding Icefield. The team also completely removed algae from some other areas to serve as a control. Doing so, the team reports, caused algae growth 1.5 times that of white snow in the watered areas and quadruple that in areas where fertilizer was added. The team then measured ice melt over a period of 100 days for all of the test areas. The researchers found that the places where algae were growing melted faster than did those with no algae, and the more algae was present, the faster the ice melted. By comparing their results with satellite imaging data, they were able to calculate the increase in melting across the entire ice field due to the presence of the algae—they found it to be 17 percent. But that was not the end of the story. The team also found that because the algae caused more melting, it meant there was more water for it to use, which increased its growth, causing even more melting. The presence of the algae created a feedback which, the team claims, is causing glacial ice to melt faster than it would otherwise. The researchers suggest the effect is likely occurring on glaciers in other places as well, including those in mountainous regions in non-polar areas. A lack of liquid water limits life on glaciers worldwide but specialized microbes still colonize these environments. These microbes reduce surface albedo, which, in turn, could lead to warming and enhanced glacier melt. Here we present results from a replicated, controlled field experiment to quantify the impact of microbes on snowmelt in red-snow communities. Addition of nitrogen–phosphorous–potassium fertilizer increased alga cell counts nearly fourfold, to levels similar to nitrogen–phosphorus-enriched lakes; water alone increased counts by half. The manipulated alga abundance explained a third of the observed variability in snowmelt. Using a normalized-difference spectral index we estimated alga abundance from satellite imagery and calculated microbial contribution to snowmelt on an icefield of 1,900 km2. The red-snow area extended over about 700 km2, and in this area we determined that microbial communities were responsible for 17% of the total snowmelt there. Our results support hypotheses that snow-dwelling microbes increase glacier melt directly in a bio-geophysical feedback by lowering albedo and indirectly by exposing low-albedo glacier ice. Radiative forcing due to perennial populations of microbes may match that of non-living particulates at high latitudes. Their contribution to climate warming is likely to grow with increased melt and nutrient input.